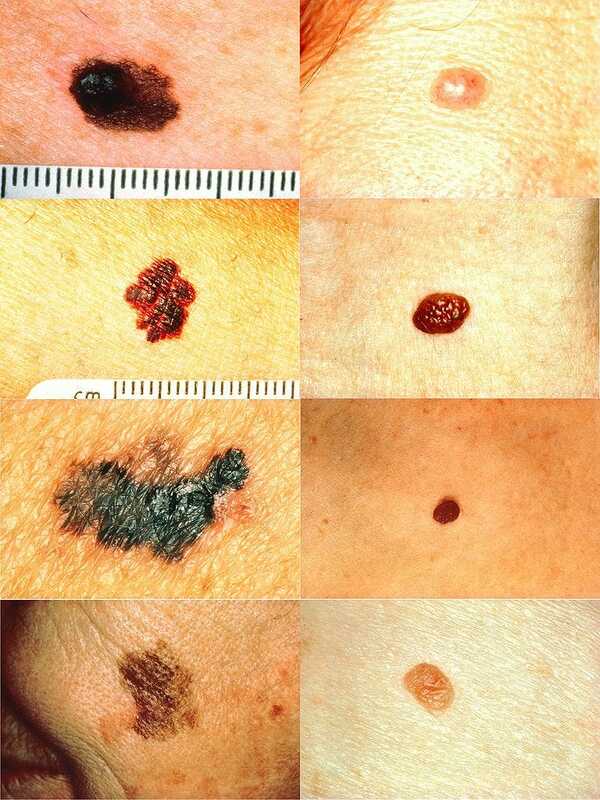 National Cancer InstituteThe left column shows examples of melanomas. The right column shows examples of normal moles. These examples are not comprehensive, and you should have a dermatologist take a look at any moles you’re concerned about. Skin cancer is the most common form of cancer in the United States. According to the Centres for Disease Control and Prevention, 20% of Americans will develop skin cancer at some point in their lives if current trends continue. Fortunately, melanoma is easy to treat if caught early enough, and it usually provides a telltale sign that you should talk to your doctor about: a mole, blemish, or mark on your skin. There’s an easy way to evaluate those moles, which can be remembered with the acronym ABCDE. A stands for asymmetry. If one half of a mole looks different from another, that’s a sign that the mole could be cancerous. C is for colour. Particularly dark or multicolored moles may be risky. E is for evolution, or change. A mole that’s changing in size, shape, or colour is definitely one that should be checked out. If anything seems amiss or if you are unsure whether a mole is risky or not, you should see a board-certified dermatologist. A dermatologist will be able to spot reasons for concern much more easily than you, so do not attempt to diagnose yourself — or assume you’re in the clear. There are some apps that say that they can evaluate a mole for you, but Derick says she wouldn’t trust them with your life. Even if an app can tell you that a mole might be risky, it can’t confirm that by taking a biopsy like a doctor can. Spotting skin cancer early is essential because that means the cancer can be removed before it spreads. Most skin cancers are caused by exposure to ultraviolet light from the sun. People with lighter skin that burns easily are more susceptible to various skin cancers, though anyone’s skin can be damaged by sunlight. The two most common types of skin cancer, basal cell carcinoma and squamous cell carcinoma, both usually occur on parts of the skin that are frequently exposed to the sun — the head, neck, face, hands, arms and legs — though they can develop elsewhere. They don’t spread as quickly as melanoma but can still spread to other parts of the body. Basal cell carcinoma grows wide and deep, which can be disfiguring if it’s not removed at an early stage.